£5 will pay for a Christmas meal for a housebound elderly person. 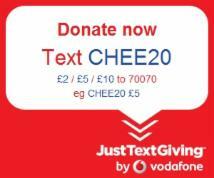 £20 will pay for an elderly person to enjoy a social lunch with other CHEER clients and volunteers. All donations, large or small, are gratefully received and go directly towards providing services which mean a lot to those who receive them. To arrange a confidential discussion about leaving a legacy to CHEER, please contact our office.